Tip 1: Establish a regular cadence of commitment and celebration. Tip 2: Develop frameworks for decision-making and time management. In a fast-paced, dynamic environment, entrepreneurs need to be able to make quick decisions and focus their energies on the areas that will impact their business the most. Lots of time can be wasted on low-value tasks or trying to make perfect choices. To encourage focus on high-value tasks, we use the "Eisenhower box." The Eisenhower box classifies actions based on urgency and importance. Dealing with customer issues, for example, is an urgent and important task, while grabbing coffee with that person who messaged you on LinkedIn may fall under low urgency, low importance. By classifying your to-do list using these criteria, you can better manage your time and eliminate low-value action items -- you'll get more productivity out of fewer hours. Is the decision easily reversible? If the decision is easily reversible and not costly, don't waste time on the decision -- go ahead with experimentation. Similarly, if the risk is costly and change is permanent, employees should engage in a thorough and deliberate decision-making process. 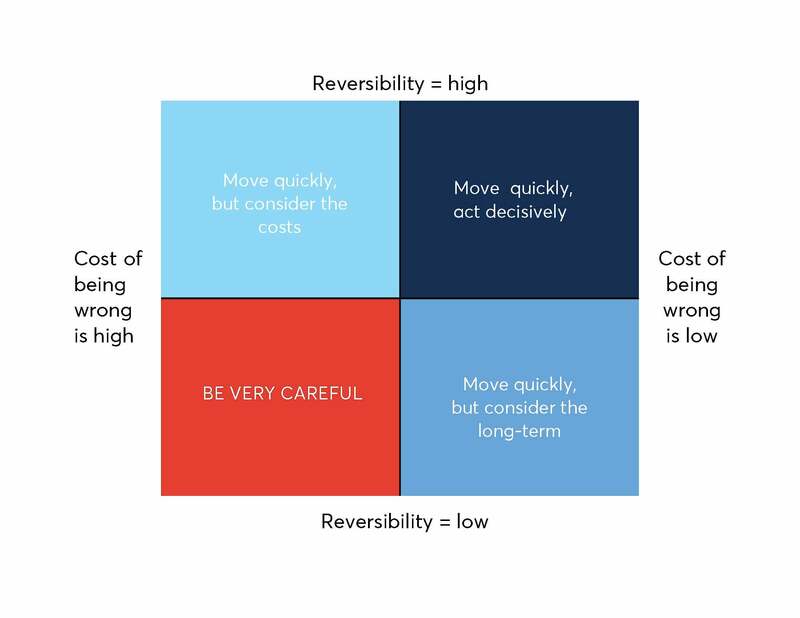 The cost reversibility matrix enables team members to move quickly and empowers them to be independent leaders of their own projects. This way, quality of work doesn't have to be sacrificed for organizational speed. Tip 3: Commit to distraction-free productivity. Stop me if you've heard this before: You set a goal at the beginning of the week, block off time in your calendar and then, halfway through your work, you get a message on your phone. Before you know it, you've wasted an hour texting and catching up on miscellaneous emails. Thanks to the internet and technology, our attention span is shorter than ever. This makes it doubly important to commit to productivity. Turn off your phone, disable calendar notifications, physically isolate yourself for blocks of time or try Chrome extensions like HabitLab. Seemingly small attention-grabbers pull you out of your work rhythm, which is damaging to maintaining deep work -- the type of work required for maximum productivity. Now, no matter how hard you try to disconnect, emails and calls will inevitably find you. It's important to resist the quick, short bursts of dopamine you get from answering them. Your monkey brain will encourage you to procrastinate, making it harder to complete simple tasks accurately and on time. To hone your focus, I recommend auditing your day to see how much time you spend on both menial and important tasks. This will help illuminate where you're wasting time and where you need to trim activities that keep you from achieving your goals. As an entrepreneur, there will never be enough time in the week to accomplish all of your goals. But, by clearly defining your weekly priorities, celebrating the wins and the mistakes, empowering your teammates and being disciplined with your time and attention, even the busiest of entrepreneurs can get more out of every week -- even ones with only seven days.